Big changes have been made to help your organization engage your audience even more efficiently! 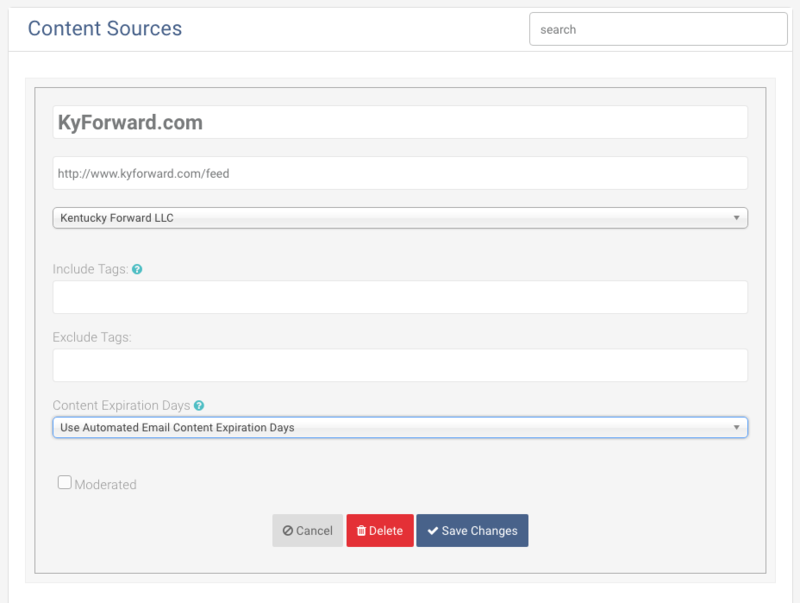 The Content Expiration Days feature (Settings > Automated Email > Other Settings) gives you a lot more control over when content expires and helps ensure that your organization's subscribers get all of the content that they are interested in. The newest, most relevant content that the subscriber has not seen will still be included first in your organization's newsletter. However, if there isn't any relevant content or enough stories to fill your newsletter, content that the subscriber hasn’t seen yet (as long as it still is within the number of days set for your Content Expiration feature) will also be included. The default expiration period for your content is automatically set to 42 days (6 weeks). After content has hit it's expired date (either 42 days after publishing, or if you choose to change this look back time) it will no longer be included in your emails - no matter its priority level. To access the organization wide expiration date head to your Settings > Automated Email > Other Settings > Content Expiration Days. When adding an external content source to your Cerkl account, you now have the ability to control how long content will be available to live in your subscribers automated newsletters. To edit the Content Expiration Days by individual Content Source go to your Settings > General > Content Sources > blue drop down arrow > Edit > Content Expiration Days. For example, let's say you're a university's athletics department! Your subscribers want instant information regarding big headlines, schedule, and success. Delivering a game's report from 6 weeks ago to your subscribers doesn't engage them at all. If you set your Content Expiration Days to 5 days or even fewer, they'll only receive updated information and breaking news instead of the headline, "Miami U. Hockey Stuns Boston University to Win Fifth N.C.A.A," six weeks after the major upset! 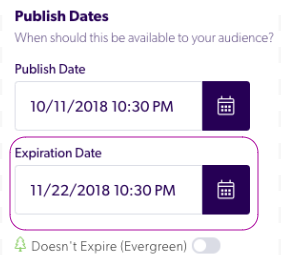 Utilizing a feature you are already familiar with, Publish Start and End Dates you can override the Organizational Content Expiration Days for a specific article or post. If you choose to leave this field blank within your article, the content will automatically expire at the Expiration Date you chose at the organizational level.